Forums » Discussions » Playing and jamming difficulties...HELP ME! » Page » Guitar Strings? Glad to hear that the new strings are working out for you Clare. Have fun playing. Sounds great, @Diane-R! New strings look better, feel better, and sound better. I know a professional guitarist who changes strings every month. I try to do so every 3-6 months on the instruments I play regularly. I am not sure why some people keep the same strings on for years. They just get hard and start hurting your fingertips, as you can testify. That's wonderful news Diane! Yay! OK. Knowing his is a Tom Yocky and his standard dulcimers have a 27.5" VSL, the strings you need, as KenWL said, at .010 plain for the two melody strings, .014 plain for the middle drone, and a .020 wound for the bass string. These are the gauges commonly found in most dulcimer string sets. 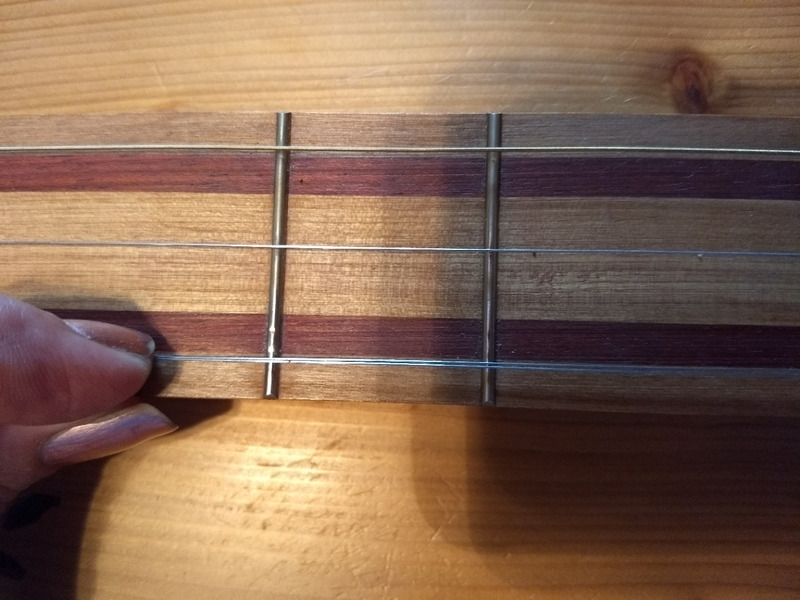 The notches in the frets aren't 'critical' to a good sound, but down the road you may want to get those notches frets replaced -- it looks like they are too deeply notched to just the filed and re-crowned. Remember, when you tune it to make sure your two D strings are in two different octaves -- the melody d string should be the same as the bass D when the bass string is fretted on the 7th fret (not the 6+ fret). FWIW -- you've now learned a painful truth -- most music shop folks, even those who have a dulcimer or two for sale, really don't know squat about our favorite instrument! Thank you Salt Springs...yes, I love my Yocky, just not too much recently. If I knew how to post a video I would so everyone could hear it. From your first post, it seems the dulcimer sounded and played fine when you used to play it a while back, and then you changed the strings and it sounds and plays badly now? If that's true and the gauge of strings you say you put on is true, then you just have the wrong strings on, and 'might' also be tuning one or more of the strings to the wrong octave. You need to get the right sized strings for the tuning you want to use. That way, it won't feel and sound 'sloppy' as you put it. 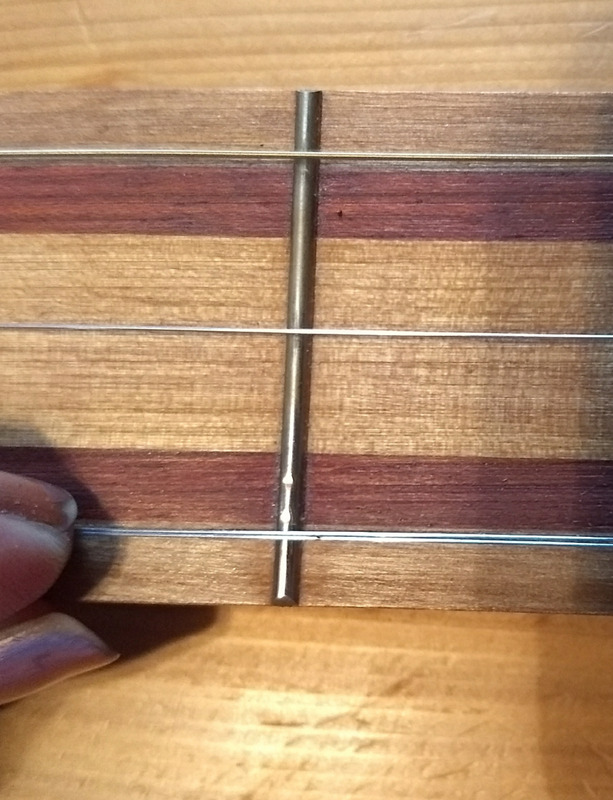 Grooves in a couple frets are not really part of the problem you describe. If you have the string package (Stay In Tune) it should tell you the gauges of strings it contained, which might tell us a lot. When you change strings, DO Not remove all of them and them put all new on. Remove and replace 1 string at a time, to keep that loose Nut and maybe the Bridge from shifting position. Question. Is the bridge setting on top of the fretboard? Or in a groove in the fretboard? Thank you... I'll take some photos & post them. It does look like there are grooves worn into some of the frets but I haven't had a chance to really examine it. It may just be dirty from the strings. These strings are a generic brand I guess called "Stay in Tune" made in Akron Ohio. They just seem to be very thick ( and painful ) compared to the ones I used to have that I had purchased from Tom. Yep. We're at the point where we need to see what's going on. Diane, if it were possible for you to add a few photos to this thread, it would definitely help those who are trying to figure out what's wrong with your dulcimer's setup. A mountain dulcimer shouldn't sound 'awful' and shouldn't need lots of strength to fret the strings either. I'm thinking there's probably something else going on here that's causing problems for you. It sounds like the tension on the bass string is greater than the tension on the other three strings. 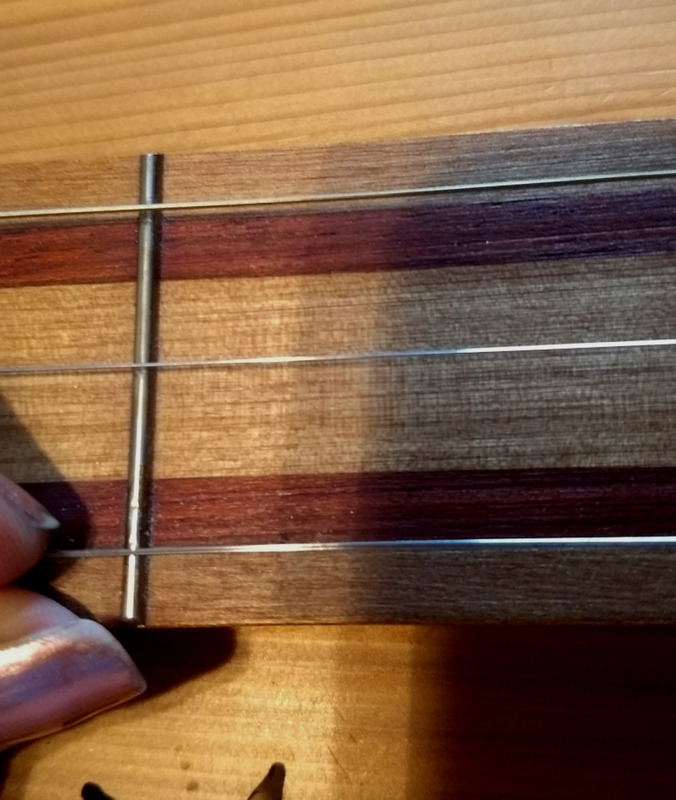 Once you remove all four string you should be able to push it back in place with your fingers. If the nut is very loose, you can use a drop of white glue to hold it in place, but don't use too much. You should be able to remove the nut if you need to make adjustments like lowering the action. When you restring the dulcimer, start with the middle strings first and bring them up to proper pitch. That should hold the nut in place while you add the melody and bass strings. Dulcimers don't have a left or right. They have a head, a tail, a near (player) side, a far side, a top and a bottom. Did the nut shift towards the near side or far side? 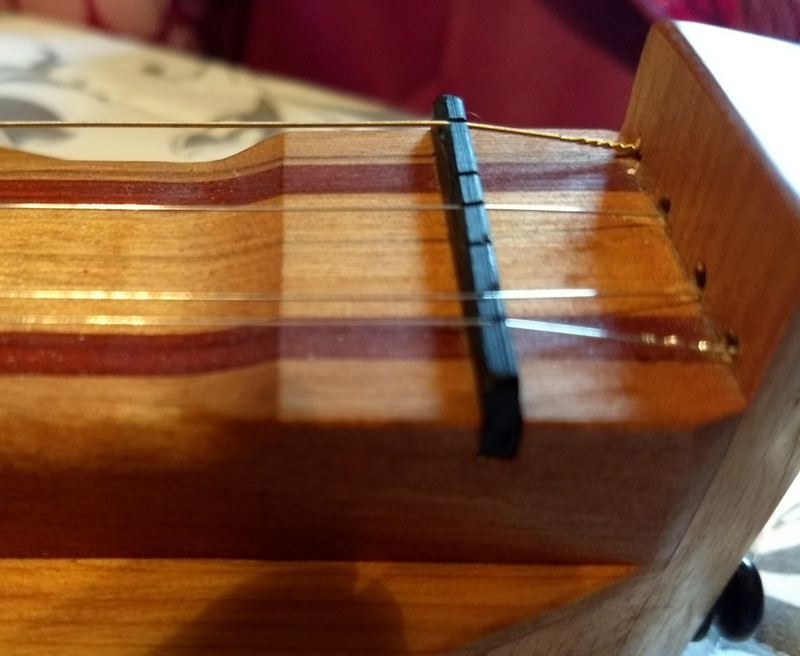 String tension should hold the nut and bridge in place. Bass string rubbing the headstock where it enters the slot to the tuning shafts isn't normally an issue, as it is outside of the nut-bridge VSL. You "repair" the loose nut by pushing, or gently tapping the nut back to where it is supposed to be and then tightening the strings. If the nut won't simply push back into place, set the dulcimer on top of a towel, on the dining table or a counter, before doing any tapping. Use a short 'punch' -- a stick, dowel, or piece of chopstick -- and a hammer. Put one end of the punch on the end of the nut and tap the other end. Eventually, @Diane-R, you will need to experiment, develop your own preferences, and find the right strings for you. Kusani has a preference for plain steel on the bass. I find plain steel does not have enough power for a bass string. I also prefer heavier strings, so I use .026 wound on the bass, .016 on the middle and .014 on the melody. But I would not recommend that for others unless they've been playing for a while and specifically want to play in a flatpicking or other style that demands tighter strings and more volume. My advice is to start with the kind of setup that was probably intended when the instrument was built, which was likely a wound .020, .022. or .024 on the bass, .012 or .014 on the middle, and .010 or .012 on the melody. Start there and then you can experiment with replacing the wound string or getting slightly heavier or slightly lighter strings or squeakless strings or whatever. Plain steel 0.020 string should be available in a local music store. As Kusani said, "opinions vary." I use squeakless wound strings for chord/melody playing. I like the plain steel on my noter/drone dulcimers. 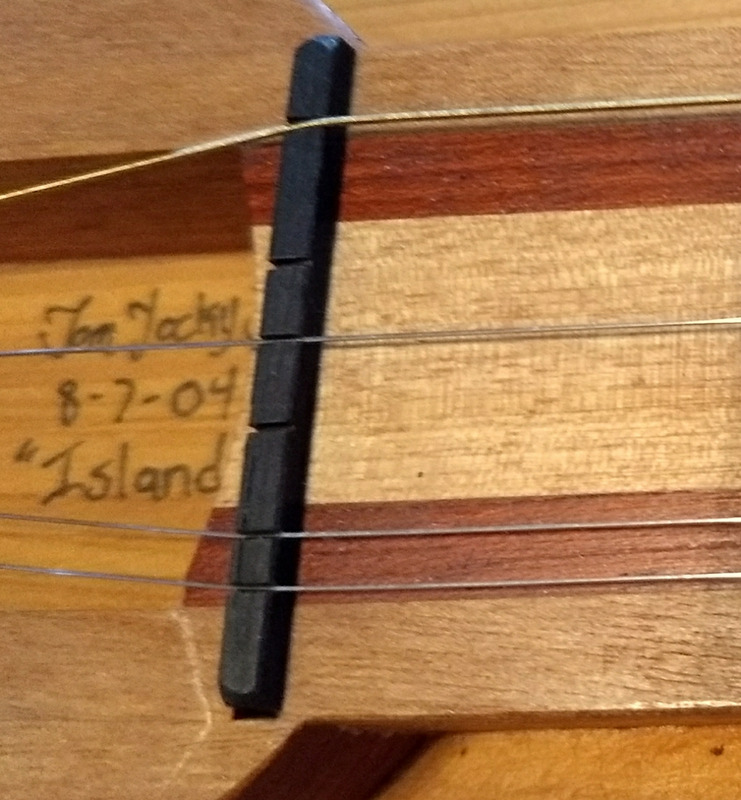 Your dulcimer looks like a Tom Yocky instrument. If it is I would think Tom set it up to take a 0.020 - 0.024 bass string. If it is set for the 0.024, the slot may cause a 0.020 gauge string to vibrate in the slot causing a buzz. This can be corrected by any luthier or even yourself depending upon how handy and confident you are. I hope the new set of strings will work well for you. Opinions vary on the plain steel, many of us do not like the 'squeak' you get from the wound strings. I don't. There are 'squeakless' base strings that are some what better; but I still prefer plain strings. Try both and see which you prefer. There is no 'right' way on this one. Thank you Ken. I will try down at the music shop where I bought the others and will let you know. But I do NOT want the plain steel for the bass string correct? Thanks again, I really do appreciate the help & advice. Given that VSL I would try .010s on the melody strings, .014 on the middle, and a .020 for the bass. You could go up just a little if these are still floppy. If you can't find them locally as single strings, PM me and I can send you a set as I described. Along the lines of what Ken and Dusty said....... 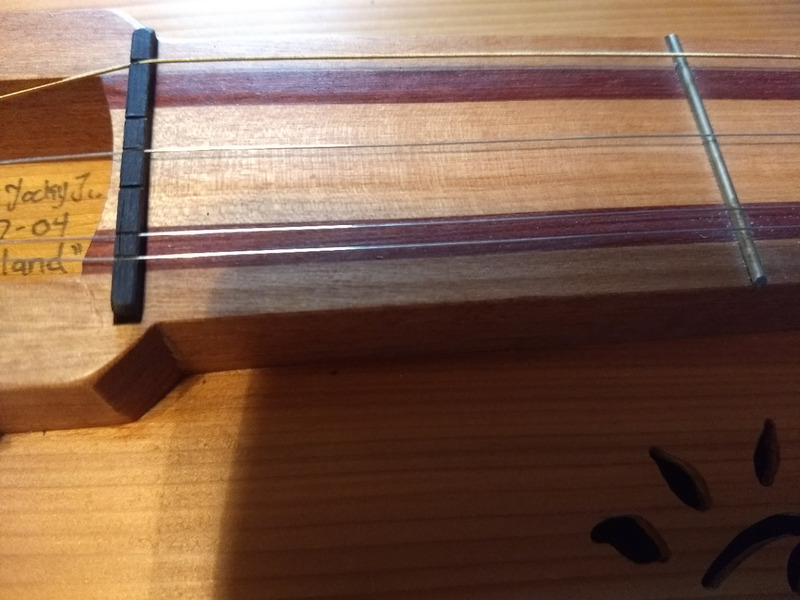 I figure most dulcimers would benefit from a custom string set instead of a generic set. Different scale lengths are a major factor and then some we all have our favorite string tension. And as you also learned we all have a preferred tone we like. Diane, the size of the strings you use is determined by the vibrating string length (VSL) of your dulcimer. That is the distance from inside the nut to the place where the strings contact the bridge. If we knew that length, we could make better suggestions. Just looking at the dulcimer in you avatar I would guess you should have the .012s on the melody strings, the .014 in the middle, and what Dusty suggested for the bass; .022 or .024 wound string. Diane, standard sized dulcimers usually use a wound bass string that's somewhere around .022 or .024. .014 is way too light for a bass sting. Secondly, how are you tuned? If you are tuned DAA, then it makes sense that your middle and melody strings would be the same gauge. If you are tuned DAd, you might want to use a melody string that's a bit lighter than your middle strings. If you use .012 on the middle, try .010 on the melody. Or you might use .014 on the middle and .012 on the melody. Also, remember that new strings stretch a lot. Whenever I put on new strings I play for a while, retuning every few minutes and also literally pulling on the strings to stretch them. I figure this gets the stretching out so they'll stay in tune better. And if you haven't played in a while, you should sound "choppy and sloppy." I find I lose technique if I just take a day off. So taking off a few years might require a bit more time before you're back into the swing of things.